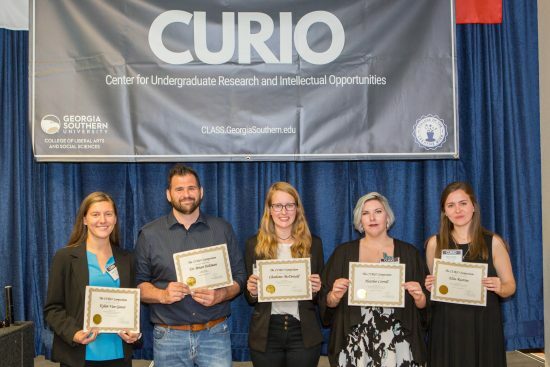 Six students received awards for their presentations at the 2017 CURIO Symposium on April 11 at the Carroll Building. Each student also received a monetary award thanks to the generous gift from Jim and Elaine Johnson. The Center for Undergraduate Research and Intellectual Opportunities (CURIO) highlights the best undergraduate research and creative endeavors of students from the College of Liberal Arts and Social Sciences (CLASS). Nearly 30 students presented on a range of topics including art, politics, history, athletic performance, human trafficking, and gender in advertising. “Our CURIO Symposium is always an exciting time of the year, and it’s great to see the creative minds of our students. The research presented here touches a wide variety of topics and disciplines,” CLASS Dean Curtis Ricker said. Each student worked with a CLASS faculty member, who assists and advises them on their project. Brian K. Feltman, Ph.D., from the Department of History, also received the Faculty Mentor Award.